Partylist Representative Teddy Casiño slammed the continued "pawnshop" practice of the Philippine Children’s Medical Center (PCMC) which preys on the desperation of poor patients who are forced to give up personal belongings to cover their hospital bills. At yesterday’s Congressional deliberation on the budget of the Department of Health (DOH), Casiño reminded Health Secretary Enrique Ona of last year's hearing when the progressive solon exposed the said practice as revealed by a memorandum issued by the hospital. He asked if it has really been stopped in light of the past DOH statements to the media that they are finding other ways to address the issue of unpaid hospital bills. "If this was not stopped I will fire the director," Secretary Ona immediately said. However, Casiño revealed a memorandum (Memorandum no 65 series 2012) signed by PCMC Director Julius Lecciones for a July 25 - August 10 bidding and sale of “collaterals." A separate invitation to bid document listed various objects for auction. "Nag-level up na po ang hospital pawnshop operations natin," Casiño announced. "Sa halip na individual items, they are now selling by lot." Among the items listed are 10 units of camera, 21 units of DVD players, 46 items of jewelry, 13 units of gadgets including iPod, 92 watches and 16 units of various properties. 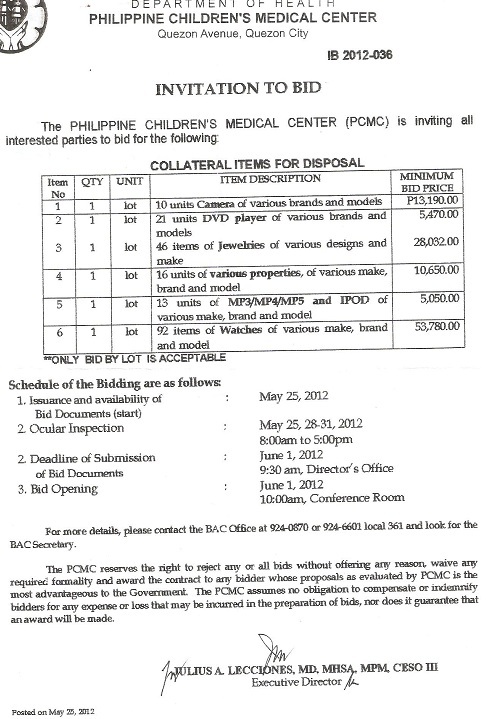 The lowest lot costs some P5,000 (MP3/MP4 players) and the highest P53,780 (watches). "Baka pwede po ipasa na natin sa Lhuillier at Villarica yung pawnshops...ask them na pumwesto sa tabi, sila na magpatakbo," the lawmaker joked. Under the proposed budget for 2013, government subsidy which is allocated for service patients (poor patients subsidized by the state) to PCMC will be cut by P100M, from P445M this year to P345M. Casiño first exposed the practice of collecting “collateral” items from patients to pay for unpaid bills in the DOH budget hearing last year. The DOH first defended the practice explaining that Republic Act 9439 (or the law prohibiting the detention of patients in hospitals and medical clinics on grounds of nonpayment of hospital bills or medical expenses) gives a hospital the permission to impose such policy. However, they also said that they are working on other programs that would provide free health services instead. During the pre-plenary budget hearing of Government-Owned and Controlled Corporation (GOCC) hospitals September last year, PCMC Director Lecciones reported that the hospital has stopped the practice . “The continuing practice of “collateral” in public hospitals should immediately stop. It breaks my heart to see our hospitals resorting to these kinds of things. This malpractice is a clear indication of the grave need to increase the budget of public hospitals instead of corporatizing them,” said Casiño.